Our Stella. She was a beautiful, perfect little girl. Our family was devastated when we found she had cancer. We were heartbroken when we told there was nothing we could do except make her comfortable and love her. Loving her was an easy request. A week after that confirmation of Stella's cancer, we lost my husband. We were all lost. 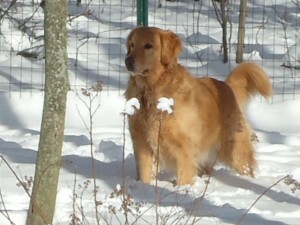 As sick as Stella was I believe her love for us let her stay on this earth to be a true and beautiful Golden. She stayed with me and listened to me, loved me and comforted me through the worst time in my life. One year to the day Stella crossed that bridge to be with Tom. I believe she suffered in silence to make sure we could start to move on and then she went to comfort Tom in Heaven. I miss them both with all my heart but know they are together watching over all of us. A true and beautiful Golden friend.